...... And AinSoft Blu-ray Ripper has a beautiful and easy-to-use interface, so you do not need to learn to use it correctly. Now download and try, you will have a good mood to finish your conversion. 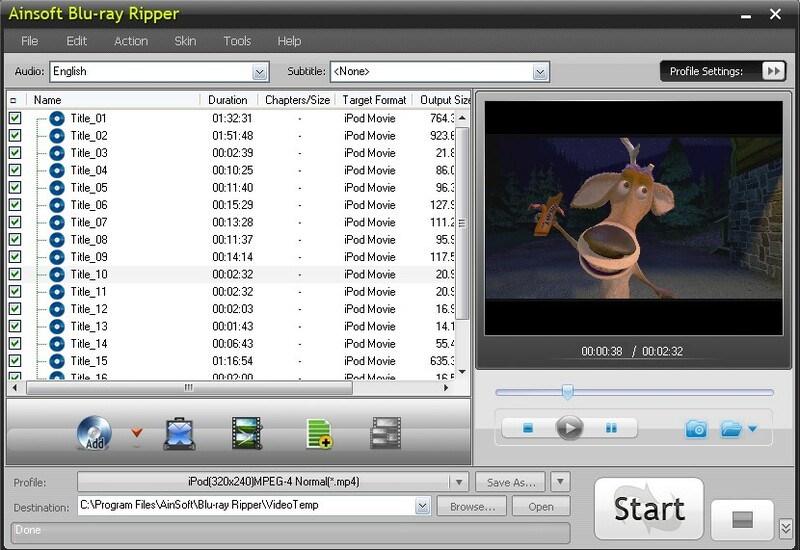 With AinSoft Blu-ray Ripper, you can get blu ray moive title,this ensures the integrity of the converted movie. Qweas is providing links to AinSoft Blu-ray Ripper 2.0.0.1 as a courtesy, and makes no representations regarding AinSoft Blu-ray Ripper or any other applications or any information related thereto. Any questions, complaints or claims regarding this application AinSoft Blu-ray Ripper 2.0.0.1 must be directed to the appropriate software vendor. You may click the publisher link of AinSoft Blu-ray Ripper on the top of this page to get more details about the vendor.